shyness in all areas of life. "It was the most terrifying experience of my life. It took most of the year to get up my resolve. Finally I sat down by the phone, a friend at my side coaxing me on. I began to dial the number . . . but then my finger pressed the receiver button and the call was canceled. "This went on for several evenings. Wednesday night had a sense of now or never. If I waited any longer, it would be too late in the week. Finally, I completed dialing the number. Her father answered, and I asked if she was home. Now I was fully committed. I wondered if I would faint." Blaine Smith did get that date. Gradually he learned a lot about how to handle his shyness. Now he shares his insights and counsel with others show struggle with the pain of shyness and who see it holding them back socially, in the workplace-- and even spiritually. "As a shy person myself, I found countless reasons for hope in Overcoming Shyness. Blaine offers detailed, practical helps--always authentic, never gimmicky or artificial. All the shy people in the world owe Blaine Smith a tremendous debt of gratitude for writing this book." "I didn't buy this book. Somebody gave it to me. I'd rather not say who. I read it sitting at home on Friday nights and thought it was pretty good, considering I had nothing better to do. I don't go along with all he says about being more assertive, but what do I know? Maybe a person should be. Scripture says that the meek shall inherit the earth. Do we want to? I don't know. But we are going to, then this book would probably help us run things, assuming we accept the deal. We'll see." Humorist, creator, "A Prairie Home Companion"
"No matter the degree of shyness a reader experiences, the author presents effective advice, which can 'overcome the unhealthy effects of shyness without losing the benefits it provides, and without violating the personality God has given.'" 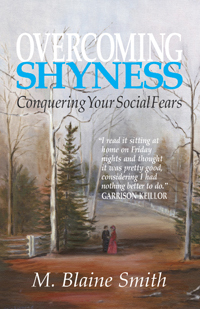 "A perceptive guide on how to handle shyness."